EvA wrote: A new menu section of grilled items (a la parilla) was inserted in the main menu; we didn't try any of the dishes from it. data point: hand lunch today (Saturday) at D'Candela, at 12:30 there was only 1 other table taken, at anytime during the 3 hours we were there, no more than a handful of tables were taken. I was surprised at how much I liked the mixed ceviche, talapia is not exactly high on my list of fish I want to dine on. Ocopa consisted of perfectly cooked boiled potatoes w/a sauce on top that tasted to me like a mild peanut sauce. Very enjoyable. Chicken was fresh off the grill, juicy as heck & packed full of seasoning. Skin was not crisp but didn't need to be IMO. 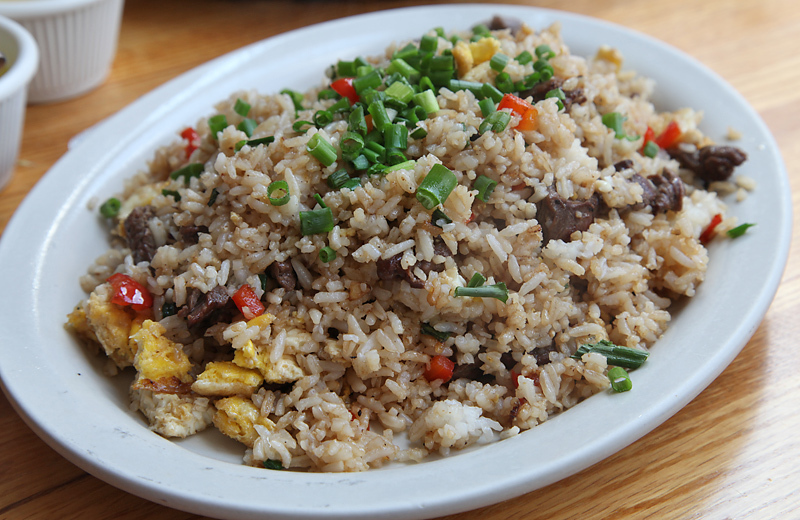 Seafood fried rice was amazing. Seeing as the seafood was so good, in the future, I'll get a whole chicken to go & dine at the restaurant on some other seafood dishes. No, these dishes have been on the menu for some time. Yep, had Papas a la Huancaina there years ago. It was fine, but I think that's just not a very exciting dish. Djew ever have sumpin taken away from you? Know the feeling of- "I want it BACK"??! but no longer accompanies ones order. Another data point.....last few times we've eaten there- the "service" has been abysmal. refill my water glass- or take my order- or buss my table. anyone else noticed a change in the way this Restaurant is "managed" (or not)? Was here this past week, weekday night dinner, started at 7:30pm. Friend & I got there at 7pm, no one in restaurant except us & eventually our entire group of 8. Cheese empanadas, veggie fried rice, papa la Huancaina (superior to ocopa I thought), 2 chickens cut into quarters, ceviche mixto. All was delicious. A REALLY nice addition this time was that someone ordered the salsa criolla as an additional topping for the chicken, salsa criolla consists of sliced onions in lime juice w/hot diced peppers. We went here recently after being on the list for at least a year. It was a fair distance away from us by public transport, but we haven't had good Peruvian in a long time. It was worth the trek. I don't have anything to add about the food. We had the already well praised chicken and a delicious chaufa. The prices seemed a little high until you see the portions. If I lived closer I could see stopping by more often. was at a dinner with 10 others this past Tuesday evening. 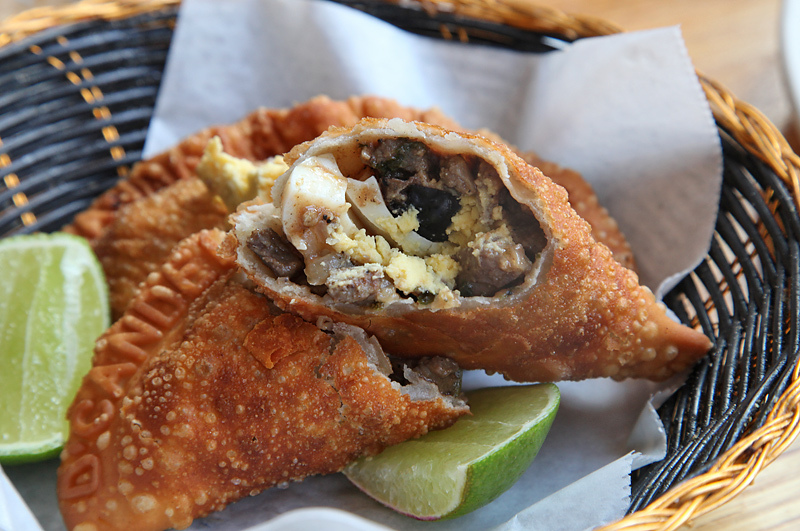 Empanadas - choice of cheese, chicken, or ground beef. We opted for some cheese & also some ground beef empanadas. Both were terrific, tasty flakey crust and savory filling, gound beef had a bit of hard boiled egg in it. Papa Rellena - mashed potato stuffed with seasoned beef, onions, egg, olive and raisings. served with salsa criolla (onions in lime juice). Again delicious, the beef, onions, olives etc are packed in the center of a small football shaped scoop of mashed potato then quickly deep fried. Anticuchos = 2 seasoned beef heart skewers. 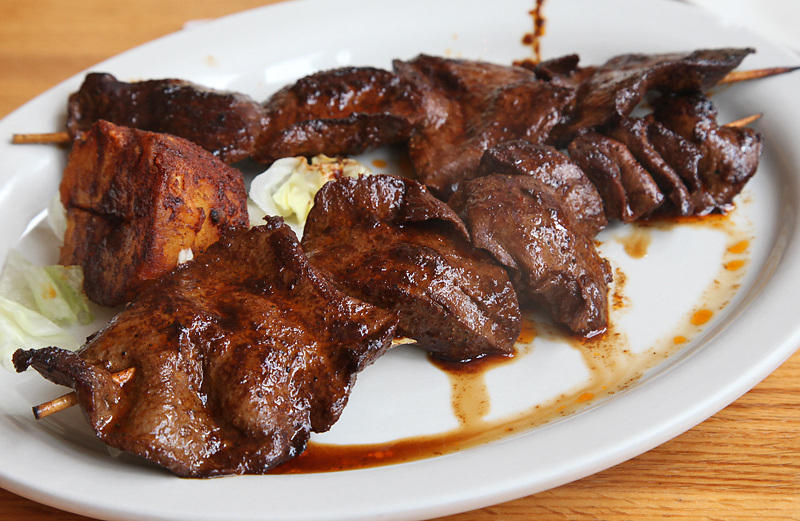 grilled, marinade included soy sauce so had a teriyaki like flavor in addition to the VERY beefy taste. 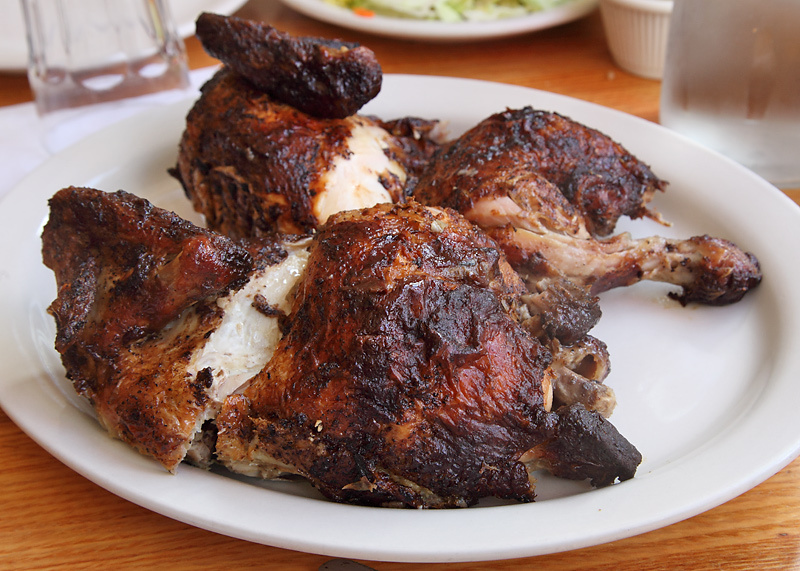 Peruvian style rotisserie (charcoal grilled) chicken, served with sides of fried yucca and sweet plantain, chicken was very moist and full of flavor. All the above was delicious, only item that was a bit off was the seafood fried rice, flavors just didn't pop like the last time I had enjoyed it. I had dinner here with a few friends on Friday night and it remains as wonderful as ever. In addition the awesome, juicy chicken, we had some tasty anticuchos, and a spectacular, large of bowl of Aguadito, which I'd never had before. It's only served there Friday-Sunday. There were some other great dishes, too. And their Aji salsa is as addictive as ever. We also learned from our server that a move is imminent. The owner has purchased a building near Irving and Pulaski. We were told the move was scheduled to happen in about 3 months and that the new space is larger than the current one. ronnie_suburban wrote: We also learned from our server that a move is imminent. The owner has purchased a building near Irving and Pulaski. We were told the move was scheduled to happen in about 3 months and that the new space is larger than the current one. There goes shopping at Village Thrift followed by rotisserie chicken. On the other hand, perhaps a brisket/chicken two-fer with Smoque. Hmmm...hoping this won't impact the delivery zone--we order in weekly and this will push them another few blocks further away. Fingers crossed. I told my non-foodobsessed, LTH-ignorant hubs about the move when it was posted here and when I asked him what he wanted for dinner tonite, he responded, well since they're moving and we don't know if we'll still be in the delivery zone, let's get the "chicken place." We do matter lol. Did this move ever happen? I can't tell from website/Yelp, but it has been nearly a year since it was mentioned. botd wrote: Did this move ever happen? I can't tell from website/Yelp, but it has been nearly a year since it was mentioned. Not that I'm aware of and when I asked about it (last time I was in), it was as if it had never been mentioned in the first place. They're still alive and kicking on Kedzie. My wife and I had dinner there last night. Cau Cau for her. Pollo Saltado for me. Clean plate club for both. All is good in the world. We order in the chicken at least a couple of times a month. My husband was NOT happy when I told him that the impending move might impact the delivery zone and he just asked me about it last month (the fact that he remembered this and cared is a testament to his love for that chicken!) I told him the same as the folks here—probably changed their mind or maybe a misunderstanding to begin with. Made our first visit last night. Had the chicken (natch), arroz chaufa, empanadas, papa rellena, Maduras. Good stuff. Chicken was very good, not great, empanadas and maduras were terrific. Key point and reason for the post: Move is said to be at end of January, and they’re looking to open at 7am with breakfast at some point. Chicken and the arroz chaufa w/fried fish were excellent as always. Service was a bit lame, but hard to get angry w/food this cheap and delicious. They ended up comping the entree that came considerably late, and all was forgiven. Jazzfood wrote: Chicken and the arroz chaufa w/fried fish were excellent as always. Service was a bit lame, but hard to get angry w/food this cheap and delicious. They ended up comping the entree that came considerably late, and all was forgiven. Your post reminded me that I'd neglected to post pictures of a typically great lunch I had there a few weeks ago . . . The most fun part for me was that it was a work lunch and I was hosting 3 people who'd never been there or even heard about it before. They were quite pleased, bordering on astounded. Had dinner last night here with 6 others. Chicken was out of sight, awesome. I've suffered the lunchtime leftover chicken and this certainly wasn't it. I find an order of Salsa Criolla (onions in lime juice) to be a must order, really enjoy this. Service was excellent, brought out a big pitcher & ice for our self made "cheating" version of a pisco sour, even offered to whip up some egg whites for our pisco sours!! It's always fun to introduce friends to places you love. We took another couple to D'Candela last week, and everything we had was at its best: beef empanadas, papa rellena, mixed ceviche, and, of course, chicken with double order of maduros. Our friends were blown away by how good the food was. Despite a huuuge party filling in right next to us towards the end of our visit, the service was excellent--food brought out at an appropriate pace, beer glasses provided for our byob, etc. There are some restaurants you wish would change up their menus a bit, but somehow with D'Candela, the old dishes just continue to please. 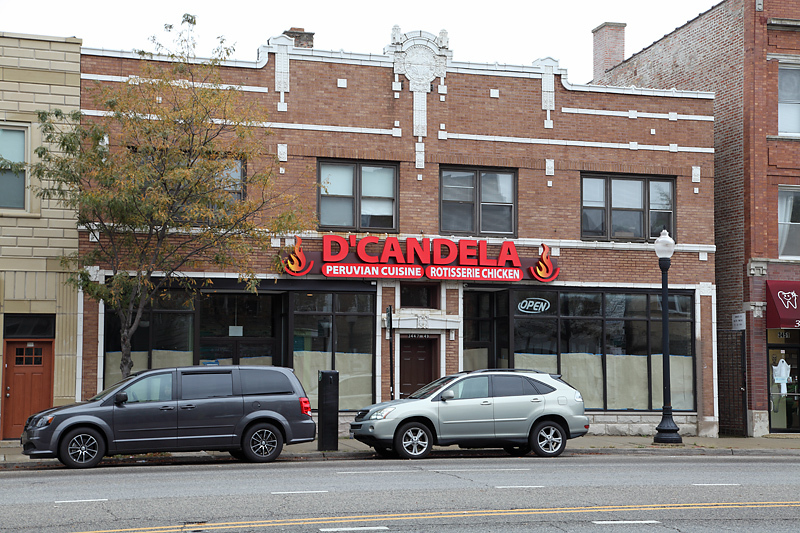 I saw signage for D'Candela while driving by a building near Kimball on the south side of Irving earlier today. I noticed it too late to get a good look exactly where it is, but you would not miss it if you were driving by and looking for it. I guess I'll soon need to walk a bit further to get my rotisserie chicken, aji, and arroz con mariscos fix. I saw the signage up today. Windows were papered up and a truck was parked in front. Move seems to be closer. Two signs in the windows of the Kedzie location: We are moving to 3447-49 W Irving Oct. TBD, 2018. Windows in new location are still papered over as of this afternoon. Not much to see yet but I happened to be in the neighborhood earlier today . . .
Had a great Lunch Special w/ Uncle Burt , yesterday. skin, the salad was flavorful and The Yucca Fritta- with a side of Onion Criolla- was perfectly crisply-fried. The waiter informed us - City Licensing Regulations/Inspectors are behind the delayed Opening of their new Restaurant on Irving @ Kimball. so if one caught fire, the flames wouldn't immediately create a (x2) fire. Also the Inspector wanted a Dishwasher-Drier-vented differently than they'd built it. from a variety of City-of-Chicago-Business Bureaucracies can stall an Entrepreneurs Hope & Dreams from making money, after months and months of money going OUT- but Nada coming IN. just before Thanksgiving- so get your calendars adjusted and marked. Sign in window of Kedzie location now says moving December 4. Now open at 3447-49 W. Irving Park Road. Parking will be an issue at this location as the north-south streets at either end of the block are 24-hour resident parking only and there are not many metered spaces on their block.